Algae blooms on Lake Erie in August. Image: Zachary Haslick of Aerial Associates Photography Inc.
Toledo and Lucas County officials are leading Ohio’s fight against Lake Erie algae. It’s a role neither group wants. But the U.S. Environmental Protection Agency regional office in Chicago has declined to declare the western basin of Lake Erie “impaired,” a designation that would trigger federal responses. And local officials say they’re impatient. “We couldn’t wait for the U.S. EPA to provide us with the impaired designation, which would have provided us the resources,” said Tina Skeldon Wozniak, a commissioner for Lucas County, which includes some of Ohio’s Lake Erie coast. It’s not that the U.S. EPA isn’t working on the problem–the agency released a draft Lake Erie Action Plan for public comment in August. It’s aimed at reducing the annual runoff of algae-feeding nutrients into the lake. But the impairment designation would establish the U.S. EPA as the coordinator of those efforts, Wozniak said. The agency could find the nutrient sources and reduce them, like it did in the Chesapeake Bay in 2010. Without that leadership, the response has been piecemeal, said Melissa Hopfer, the sustainability project manager with the Toledo-Lucas County Sustainability Commission. “What we’ve been told is that an impairment designation won’t necessarily make anything happen,” she said. “We’ve been told it isn’t important. U.S. EPA officials did not respond to repeated requests for comment. Toledo, Lucas County and the Toledo Metropolitan Area Council of Governments are funding their own programs. The algae on their doorstep is fed by pollution from all over western Ohio, from each stream and river that runs to Lake Erie. The agencies wanted to find out exactly where that pollution was coming from, so they began inventorying nutrient sources, said Hopfer. The Western Lake Erie Basin Nutrient Sources Inventory compiles data on water quality, unsewered areas, sewage overflows, permitted pollutants, agricultural and manured areas–factors that play an important role in water quality. “Before you can solve a problem, you have to identify all the sources; you have to identify the problem itself,” said Rem Confesor, a senior consultant with Civil & Environmental Consultants Inc., the Toledo-based private engineering firm that’s carrying out the project. The goal is not to point the finger only at farmers, said Tim Murphy, senior project manager with Civil & Environmental Consultants. It is true that farms are a major source of phosphorus runoff, but the project maps nutrient sources of all kinds, he said. Toledo and Lucas County officials would prefer the state or federal government to take the reins, Hopfer said. But presentations of their online tool to the Ohio EPA and the National Resources Conservation Service failed to produce funding or partnerships. The Ohio EPA did provide data for the inventory, said Heidi Griesmer, the agency’s deputy director for communications. No formal request for funding has been made for the project, she said. Toledo and Lucas County want the EPA to begin writing the checks. U.S. EPA wants to reduce annual nutrient runoff into Lake Erie by 40 percent of 2008 levels by 2025. That means cutting 7.3 million pounds of phosphorus runoff every year. Ten years in, phosphorus has been cut by 34 percent of the goal – 2.4 million pounds per year. That leaves 66 percent to go in the next eight years. If there is good news, it’s that it takes time for new mandates, programs and farm practices already in place to show their effects. The numbers probably don’t yet reflect the progress made in the past few years. Much of the water quality data they’re working with comes from single samples, Murphy said. That’s a problem as the firm models how new practices cut the nutrient load for all of Lake Erie, he said. Constant monitoring would give researchers a more complete picture of the ebbs and flows of water quality and the factors affecting it. Continuous monitoring is already deployed in buoys on Lake Erie. Similar systems can work in the watersheds, Murphy said. But a single monitor costs $45,000, he said. Operation and maintenance runs $25,000 annually. And the program needs 10 more monitor locations to achieve the accuracy they want. Not everyone believes a state or EPA impairment designation and the regulation that it brings would be beneficial. Jamie Clover Adams, the director of the Michigan Department of Agriculture and Rural Development, told reporters in June that the state Department of Environmental Quality’s state-level impairment designation would do little to help. Farms are a major source of nutrient runoff, mainly from animal waste and fertilizers that are carried into streams after heavy rains. Farmers acknowledge that and are ready to change their practices, Adams told reporters. Her agency supports encouraging voluntary efforts by farmers to curb the nutrients. Others argue that voluntary measures don’t work. The U.S. EPA’s Lake Erie Action Plan lacks accountability and teeth, Hopfer said. The nutrient reductions need to be made while finding a way to keep farmers in business. She believes an impairment designation would help. The Toledo Metropolitan Area Council of Governments is also taking the lead on a related regional issue–failing septic tanks. An estimated 31 percent of on-site septic systems in Ohio are failing, said Kris Barnswell, the council’s water quality planner. That contributes to 3 to 5 percent of the annual load of phosphorus into Lake Erie. Many older systems are owned by people who don’t know much about maintaining them, said Kurt Erichsen, the council’s vice president of water quality planning. In some cases, partial or wholly untreated sewage flows through ditches and storm drains and into Lake Erie. The council is identifying areas in 19 western Ohio counties that could be serviced by extending the sewer system, Barnswell said. It proposes to to expand the project to Indiana and Michigan. 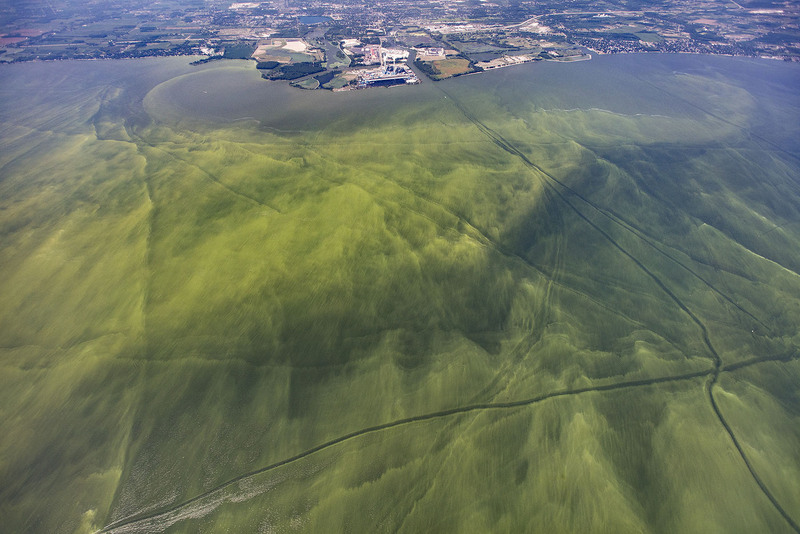 “There are a significant amount of these systems out there that we have reason to believe are failing, and if we want to solve the microcystin bloom problem on Lake Erie, this is part of the solution,” Erichsen said. Expanding sewers means cutting down on potentially-failing septic tanks. But like many water infrastructure problems around the country, state funding is tight. “Every sewer project is competing with every other sewer project across the state that needs money, and there’s never enough money to go around,” Barnswell said.